We’d love your help. Let us know what’s wrong with this preview of Noble House by James Clavell. This is an alternate cover edition for ISBN13: 9780440164845. The tai-pan, Ian Dunross, struggles to rescue Struan's from the precarious financial position left by his predecessor. To do this, he seeks partnership with an American millionaire, while trying to ward off his arch-rival Quillan Gornt, who seeks to destroy Struan's once and for all. Meanwhile, Chinese communists This is an alternate cover edition for ISBN13: 9780440164845. The tai-pan, Ian Dunross, struggles to rescue Struan's from the precarious financial position left by his predecessor. To do this, he seeks partnership with an American millionaire, while trying to ward off his arch-rival Quillan Gornt, who seeks to destroy Struan's once and for all. Meanwhile, Chinese communists, Taiwanese nationalists, and Soviet spies illegally vie for influence in Hong Kong while the British government seeks to prevent this. And nobody, it seems, can get anything done without enlisting the aid of Hong Kong's criminal underworld. Other obstacles include water shortages, landslides, bank runs and stock market crashes. To ask other readers questions about Noble House, please sign up. Is this book part of a series or does it stand alone? 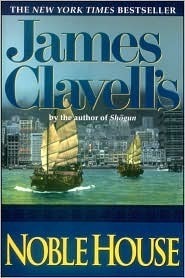 This is the fourth novel of the "Asian Saga" by James Clavell. I loved the TV miniseries adaptation of Noble House, starring Pierce Brosnan, Deborah Raffin, John Rhys-Davies and Ben Masters. In fact, I can say that it's my favorite TV miniseries. I have it on DVD and crossing fingers that they'd release it on bluray anytime soon. ...boy! I didn't think that it was so thick! And a huge bummer for me, taking in account the TV miniseries adaptation, it was that the main characters of Ian Dunross and Casey Tcholok don't have a romance, besides the age difference between literary character, Dunross instead of being a widower, he is happily married and even having children. Also, there are A LOT of sub-plots that after a while become quite tricky of following. However, it's still a pretty good written work, so I don't see any reason to give it less stars than the maximum possible. ...but a very looooong one! ...and a very important half coin. All in just one long week. Ian Dunross Struan, Tai-Pan of Struan's, Noble House of whole Hong Kong. Never gets old, never gets tired of mentioning. Smart, resourceful and a gentleman. BUT there is only ONE true Tai-Pan in Hong Kong and is whoever is in command of Struan's, the Noble House, the most prestigious trade company in the city. And Ian Dunross is the current Tai-Pan (tenth in the book, twelfth in the TV miniseries) and since he needed to make Struan's public on the market, now he's dealing with a risk of losing control of the company. Especially since Struan's, like any successful company, it has an archenemy company which is Rothwell-Gornt, managed by Quillan Gornt, and not only that, since the bitter enmity runs deep back in the past of Ian's and Quillan's families since the days of Tai-Pan novel. ...Par-Con, an American company comes in the middle, with CEO Lincoln Bartlett (huge fan of Sun Tzu's Art of War) and his vice-president Casey Tcholok (cunning woman who knows how to use all her personal resources to get what she wants). ...and where everybody wants to be THE Tai-Pan. Struan's is a very old company, founded in the 1800s, and it wasn't easy to do, so it was needed to ask for favors to make possible the company which eventually would become the Noble House. ...things in Hong Kong tend to change of hands too fast, and now the current owner knows well the power that the half-coin encloses! In many ways, this is my favorite Clavell novel. I'm kind of a big sucker for it. It's a huge, vastly sweeping epic contained entirely within a single week in Hong Kong. It's a blockbuster of a novel in every sense, bringing equal amounts of entertainment and intellectual provocation. There's something else going on in this novel which gives it added joy for those who have devoured the rest of the Asian saga -- in Noble House, Clavell begins to tie together the characters from all his other nove In many ways, this is my favorite Clavell novel. I'm kind of a big sucker for it. Another fantastic part of Clavell's Asian Saga, this continues the story of the Noble House, created by Dirk Struan in Tai-Pan & continued in Gai-Jin. It is set in Hong Kong & takes place over a week or so in 1963. There are a LOT of words for such a short time period. It's not as tight a story as Tai-Pan, but similar in many other respects. Tai-Pan took place in 1841, the founding of Hong Kong. It follows the trials & tribulations of Dirk Struan. This book, Noble House, follows the g Another fantastic part of Clavell's Asian Saga, this continues the story of the Noble House, created by Dirk Struan in Tai-Pan & continued in Gai-Jin. It is set in Hong Kong & takes place over a week or so in 1963. There are a LOT of words for such a short time period. It's not as tight a story as Tai-Pan, but similar in many other respects. Tai-Pan took place in 1841, the founding of Hong Kong. It follows the trials & tribulations of Dirk Struan. This book, Noble House, follows the green-eyed devil's true heir through similar tribulations in Hong Kong over a century later. The similarities & differences are fantastic. There are a lot of politics with crafty spies from China, America, England, & Russia. Cut throat business arrangements among these nations & Japan play on a wildly open stock market & banking system which tests Dunross' ability as The Tai-pan of the Noble House. He's just a business man, yet one of the most influential people on the island who carries a number of cares that would break a lesser man. The blow by blow accounting of the week fits in an incredible amount of action. There's very little rest for anyone as the perfectly drawn characters maneuver for position. Motivations are wonderfully done. There are no angels, but many sympathetic characters, especially Dunross, a main character that is easy to get behind, but even he isn't perfect. The secondary characters are often as fully drawn & full of surprises. The only complaint I had was that some of the Oriental characters were a bit two dimensional in some attitudes. Not all of them, but the mass were. Clavell does a great job in describing their poverty, drive, priorities, & abilities, though. This leads to some wonderfully comic moments - an old, abandoned amah calculating percentages on her take with the precision & speed of a calculator. It's also sad - people selling their children to feed the rest of the family. These books are listed in published order here on GR now. That's NOT the chronological order, the order I'd highly suggest reading them in. If you're tight on time, my suggestion would be to read King Rat or Shōgun as stand alones. While all the books share some families, the time difference between these 2 minimizes that. If you can find the time, Tai-Pan, Gai-Jin, & Noble House make a great trilogy. Skipping Gai-Jin wouldn't hurt. It wasn't yet published when I first read the series & I didn't miss it. Unlike the rest, it doesn't have a strong central character to root for, so it's rather jarring in that sense. Definitely read this book after Tai-Pan, though. If you like audio books & can listen to these 3 read by John Lee, you're in for a real treat. He might be the best reader I've ever listened to & I'm quite picky. Ding-dong the witch is dead!. 6 months and 1400 pages later, I have finally finished this massive door stopper of a novel, and the best I can say about it is that its better than Gai-jin, the massive tome about Struan's in 1870s Japan which also took me most of a year to get through. I've been reading a book of Clavell's Asian Saga per year since college, a privileged position on my reading list accorded to him because I so enjoyed Shogun, Tai-pan and King Rat. The plot of this novel moves at a s Ding-dong the witch is dead!. 6 months and 1400 pages later, I have finally finished this massive door stopper of a novel, and the best I can say about it is that its better than Gai-jin, the massive tome about Struan's in 1870s Japan which also took me most of a year to get through. I've been reading a book of Clavell's Asian Saga per year since college, a privileged position on my reading list accorded to him because I so enjoyed Shogun, Tai-pan and King Rat. The plot of this novel moves at a snail's pace for 1100 pages, and only picks up after that, at which point you've been reading for months and still have an equivalent of a reasonably sized novel to go. The plot meanders through about 20 sub-plots only half of which get resolved to any satisfaction, and some of which get resolved by deus ex machina in a highly unsatisfactory way. As always, the magic of Clavell is in bringing a time and place to life, as he brought to life 1500s Japan and 1840s Hong Kong. He does that here as well, but the problem is that 1960s Hong Kong is too familiar to be interesting. I will say there are interesting bits. The politics are fascinating, with the main character arguing emphatically that the US and Britain should help out the PRC on the grounds that they are thorns in the sides of the USSR which is the real threat. This to the point of selling materials to China to create nuclear weapons and helping the Thread of the Silkworm guy to defect in order to secure the Bank of China's aid during a monetary crisis. The gender politics are a fascinating mix of Randian ideas of self-sufficiency and a kind of parochial British love of the nuclear family. The action is also fascinating, since all of it takes place in scenes of tense negotiation in board rooms and pool halls and race tracks, rather than in any kind of violence. The summer of 1990, I worked on a project in Phoenix, AZ. For 6 or 8 weeks, I flew every Sunday afternoon from Dallas to Phoenix and flew home Friday night. I was the only project team member in Phoenix, and my personality is not the kind to go out exploring on my own. So a summer of plane flights and evenings alone were the perfect time to read this book. I had a wonderful hotel room with a balcony facing northwest and almost every evening I would return to the hotel and sit out on the balcony The summer of 1990, I worked on a project in Phoenix, AZ. For 6 or 8 weeks, I flew every Sunday afternoon from Dallas to Phoenix and flew home Friday night. I was the only project team member in Phoenix, and my personality is not the kind to go out exploring on my own. So a summer of plane flights and evenings alone were the perfect time to read this book. I had a wonderful hotel room with a balcony facing northwest and almost every evening I would return to the hotel and sit out on the balcony and read this book until the sun went down. The Asian Saga: the story of a Hong Kong business dynasty. A fascinating saga written with tremendous talent. Very interesting page turner and one of the best books I have ever read. Clavell includes a bank run, a bear raid, international intrigue, relationship/sexual tension, smuggling operations, natural disasters, multi-generational rivalry, blood oaths, espionogue and dramatic natural disasters in an extremely action packed period of little more than one week. A long book (as are all my favorites) but a very interesting read and one which I highly r A fascinating saga written with tremendous talent. Very interesting page turner and one of the best books I have ever read. Clavell includes a bank run, a bear raid, international intrigue, relationship/sexual tension, smuggling operations, natural disasters, multi-generational rivalry, blood oaths, espionogue and dramatic natural disasters in an extremely action packed period of little more than one week. A long book (as are all my favorites) but a very interesting read and one which I highly recommend! Since I am reviewing the audible.com version I must also comment on the talent of one of the most talented readers on audible, John Lee. I have listened to many previous books by John Lee, and I have always enjoyed them. However, I have never listened to a book that allowed John to display his talent as well as this one. Lee did an excellent job at all the different accents, the different personalities and the distinct situations. This epic saga of a great British mercantile house in Hong Kong in the early 1960s is a 1400 page tome whose plot takes place in the space of one week. The action in the novel is intense. In Noble House, you get the feel of a staunchly capitalistic Hong Kong, a place that makes the setting of "The Jungle" look like a worker's paradise! Clavell's hero, like most of Clavell's heroes, is an alpha male and the absolute monarch of the family business which controls much of Hong Kong's commerce and po This epic saga of a great British mercantile house in Hong Kong in the early 1960s is a 1400 page tome whose plot takes place in the space of one week. The action in the novel is intense. In Noble House, you get the feel of a staunchly capitalistic Hong Kong, a place that makes the setting of "The Jungle" look like a worker's paradise! Clavell's hero, like most of Clavell's heroes, is an alpha male and the absolute monarch of the family business which controls much of Hong Kong's commerce and power. The problem that I had with Noble House was the tendency of Clavell to minimize his Chinese characters, to glorify the ruthless, and to treat women as tools of the alpha male. This is a common characteristic of Clavell novels, it just happens to be more pronounced in "Noble House". The novel also had, dare I say it, too much action in it. Within this one week period we read about espionage activities of the Soviets and the Communist Chinese, the machinations of Hong Kong, British and American corporations, horrible catastrophes such as bank failures, floods, earthquakes and riots, and plots involving organized crime. That's a pretty heavy week, even for Hong Kong tycoon family. It strains credibility, but then again this is a novel and not a history. Novels are meant to be compelling, and one must admit that Clavell knows how to hold the reader's attention. If you haven't read James Clavell's Asian Saga you are depriving yourself of an amazing journey that begins in the 15th century in Japan's feudal Shogunate period, capturing your attention and your imagination with "Shogun," and refuses to let go as you move through the series with Tai Pan, Gai Jin, King Rat, Noble House and finally Whirlwind. Clavell was an incredible story-teller who opens up a world and a culture largely unknown to those of us in the West, and it is a profound loss to the lit If you haven't read James Clavell's Asian Saga you are depriving yourself of an amazing journey that begins in the 15th century in Japan's feudal Shogunate period, capturing your attention and your imagination with "Shogun," and refuses to let go as you move through the series with Tai Pan, Gai Jin, King Rat, Noble House and finally Whirlwind. Clavell was an incredible story-teller who opens up a world and a culture largely unknown to those of us in the West, and it is a profound loss to the literary world that he passed away before he was able to finish the entire saga. However, don't let that scare you away as I promise you won't be left wanting. Popular fiction bordering on great. As with many of James Clavell's works they could easily be viewed as dated rather than a period work or 'historical fiction'. This view of mine is based on how Clavell relates the contemporaneous social and political views of the time in his works. Whether he was writing for the ages is doubtful, but the plot and story is timeless. Greed and intrigue and power are always sound subjects on which to build a tale. Dated or not I've got to read this and several of Popular fiction bordering on great. As with many of James Clavell's works they could easily be viewed as dated rather than a period work or 'historical fiction'. Dated or not I've got to read this and several of the authors works again for probably the first time in twenty or more years. Не толкова добра, колкото "Шогун" или поне на мен така ми се стори. Хубавото е, че освен като продължение на "Тай-пан", в "Търговска къща" Клавел продължава историите на някои от героите си от предишните си книги, дори и на тези от "Шогун". Действието се развива бързо и няма как да ти доскучее, докато я четеш. Героите са многопластови, изградени с много мисъл и план. Not quite as good as Tai-pan, but a continuation of it & anyone who liked the first will like this. Is almost as well done. Set in the 1960's, it's similar in a lot of ways to Tai-Pan. One of the cool things is Clavell writes himself into this book as a reporter, Peter Marlow. It's not a huge part, but fun. Последните няколко месеца прекарах в един непознат за мен край на света Китай или по точни Хонгконг. Благодарение на Клавел успях да се запозная с тяхната култура и обичай. Страхотен , динамичен и завладяващ роман. Нямах търпение да чета напред за да разбра какво ли се случва , но сега ми е някак тъжно че стигнах финала. Толкова много ме заинтригува че си слагам Хонгконг в списъка с местата на които бих искала да отида. I so love the sagas. Historically rich and covers all facets of the era and place. Setakat ini,saya hanya membaca Shogun dan Noble House. Tetapi,seperti Shogun,membaca Noble House merupakan suatu pengalaman pembacaan yang sangat mengasyikkan dan mengagumkan! Agak sukar untuk mengklasifikasikan genre novel ini. Mungkin boleh saya simpulkan bahawa terdapat pelbagai elemen seperti cinta,pengkhianatan,thriller,korporat,espionage, dan lain-lain elemen yang berkaitan. Kesemuanya disatukan di dalam sebuah cerita yang dipersembahkan dengan amat baik sekali. Tambahan pula,Clavell merupakan seorang story-teller yang sangat bagus. Dialog yang ditulis juga sangat berkesan. Ini ditambah lagi dengan pembentukan dan perkembangan watak-watak yang sangat menarik sekali. This book had some great moments (like connection to "King Rat"), but yet it was short to deliver. It had too much boring scenes and too much "business talk" for my test. Before I read this book, I read "Gai-Jin" which considers far worst book than this one, but I loved it. I was hopping that this one (considers as one of his best) will be at least as good as "Gai-Jin", unfortunately for me it wasn't. I think that this book is better in a second reading, and I think that maybe in one day I'll want to reread the whole saga, and I hope I'll love it as I loved the previous ones. 4.5 Clavell est fidèle à lui-même! Les intrigues s'enchaînent à un rythme effréné. On y découvre le Hong Kong des années 60; rencontre de l'Orient et de l'Occident dans le contexte économique et politique précaire de la Guerre Froide. À lire... captivant du début à la fin, à l'instar de 2 autres de ses chefs d'œuvre : Taï-pan et Shogun! Wow... this was a good book... no, scratch that... this was a GREAT book. It built upon all of his previous novels, including Shogun. It has to be one of my favorites of his. За пръв път посегнах към Клавел и неговите книги в далечната вече 1993 г., по време на лятната ваканция между 10-ти и 11-ти клас. Помня, че неговият "Цар Плъх" дотолкова ме грабна, че нямах търпение да започнем училище, за да споделя впечатленията си с моята учителка по литература - г-жа Валерия Ангелова, която безкрайно обичам и уважавам и до днес. Тогава нямаше социални мрежи, нито групи, в които се публикуват снимки на скъпоструващи булевардни романчета, редом до кристални чаши с вино или на За пръв път посегнах към Клавел и неговите книги в далечната вече 1993 г., по време на лятната ваканция между 10-ти и 11-ти клас. Помня, че неговият "Цар Плъх" дотолкова ме грабна, че нямах търпение да започнем училище, за да споделя впечатленията си с моята учителка по литература - г-жа Валерия Ангелова, която безкрайно обичам и уважавам и до днес. Тогава нямаше социални мрежи, нито групи, в които се публикуват снимки на скъпоструващи булевардни романчета, редом до кристални чаши с вино или на фона на красиви морски залези. Четенето беше само по себе си нещо като свещена автотерапия и интелектуална самозащита, а не показно фукане и бизнес, в което, за съжаление, се превръща то днес. Но това е друга тема. Още тогава, преди 25 г., се влюбих в този мъж - Клавел. Той стана един от любимите ми разказвачи. Докосвах се в внимание и нежност към всеки един от романите му. Учех се от тях на мъдрост, търпение и сила. Опознавах, доколкото е възможно, тази необятна и нелогична вселена - светът на Азия. Днес, след толкова много години, стоя на предпоследната спирка на Сагата - "Търговска къща", която току-що завърших и се опитвам да я осмисля. Със сигурност ще взема от нея много - мисли, емоции и преживявания. Също толкова много няма да мога да проумея. Но с книгите е така. От тях взимаме толкова интелектуален и емоционален заряд, колкото можем да носим към настоящия момент от своя живот. "Джос", както казват китайците - нещо като съдба, свръхестествена предопределеност, прищявка на боговете. Винаги са ме впечатлявали чисто човешките, "обикновени", истории. На пръв поглед "Търговска къща" не е точно това, но само на пръв поглед. Нещата в Азия не винаги са такива, каквито изглеждат. Някъде сред световните проблеми на Студената война, корпоративния свят на интересите, парите и борсовите спекулации, Клавел умело вплита и човешките отношения, чувства, стремежи и слабости. Поставя теб и героите си пред морални дилеми и избори, пречупени през призмата на Изтока. Въвежда те в един свят, който се подчинява на собствени закони и има свои пътни знаци: Чест, Дълг, Престиж, Лоялност, но с източен привкус. Впечатли ме отново голямата любов, с която Клавел развива и обогатява героите си, както и умението му да ги движи леко и грациозно по шахматната дъска на събитията в романа. Всичко това превърна "Търговска къща" в една от онези книги, за които казвам, че "не ме оставят намира", докато не ги прочета. I don't know how the author classified the novel, but for me this is an interesting mix of business and thriller. The reader is one of the few to know what is going on some of the time with most of the other people grasping at straws they only think may exist. This adds incredible levels of complexity, with the reader trying to figure out at every point how the next piece of information their favourite character--whoever that is, and there are plenty of options--is affected by whatever new fact surfaced most recently. Epic novel! 1400+ pages but I made it. Very readable novel with lots of subplots going on which I really enjoyed. There were a couple of things that bothered me though. One was a scene between Casey and Quillan on his yacht in which, to my mind at least, her reaction was fantastical and extremely unrealistic (or likely!). I also wonder if that scene would be written like that today (this book is 38 years old!). The second is the dialogue between the Hong Kong Chinese. If this book is to believed Epic novel! 1400+ pages but I made it. Very readable novel with lots of subplots going on which I really enjoyed. There were a couple of things that bothered me though. One was a scene between Casey and Quillan on his yacht in which, to my mind at least, her reaction was fantastical and extremely unrealistic (or likely!). I also wonder if that scene would be written like that today (this book is 38 years old!). The second is the dialogue between the Hong Kong Chinese. If this book is to believed their conversations mostly consist of insulting each other! The incredible saga of the development and exploitation of modern Hong Kong. Best novel ever written, maybe. I finalllyy finished this huge brick last evening. "Good grief" said C. Brown. What a monster of a book/story, even by Clavell standards. Many subplots; too many. I enjoyed NH - 3.5stars - but the story and subplots were convoluted. Granted the book takes place within the time span of 1week, but there was too much going on in the story line. I loved Shogun and really liked Tai-Pan. Gai-Jin, not quite as much. I'd rank NH on par or just below Gai-Jin in order of enjoyment. This is a must read for I finalllyy finished this huge brick last evening. "Good grief" said C. Brown. What a monster of a book/story, even by Clavell standards. Many subplots; too many. I enjoyed NH - 3.5stars - but the story and subplots were convoluted. Granted the book takes place within the time span of 1week, but there was too much going on in the story line. I loved Shogun and really liked Tai-Pan. Gai-Jin, not quite as much. I'd rank NH on par or just below Gai-Jin in order of enjoyment. This is a must read for Clavell fans. If you enjoyed the earlier books in his Asian Saga then I'd recommend NH. But as a stand alone novel... it's definitely an effort. With the background knowledge of the Struan/Brock clans NH is enjoyable. Go read Shogun and Tai-Pan first. If you enjoy those two books then you'll appreciate NH. Will you also love NH, maybe. James Clavell is known for his thick books, this one is nearly 1400 pages long! Normally I like thick books - more story to read - but this one simply isn;t as good as Shogun. There were parts of this book that were really good and exciting, but other parts were very podding and I found myself frustrated with them. Shogun was so interesting because Blackthorne/Anjin was immersed in Japanese culture and had to learn how to survive and fit within it, but the rest of the books did not follow this fo James Clavell is known for his thick books, this one is nearly 1400 pages long! Normally I like thick books - more story to read - but this one simply isn;t as good as Shogun. There were parts of this book that were really good and exciting, but other parts were very podding and I found myself frustrated with them. Shogun was so interesting because Blackthorne/Anjin was immersed in Japanese culture and had to learn how to survive and fit within it, but the rest of the books did not follow this formula. It would have been nice if Clavell had written another book about a European stuck/stranded in another culture - it would be fun to see him try to deal with Chinese life and etc. James Clavell, born Charles Edmund Dumaresq Clavell was a British novelist, screenwriter, director and World War II veteran and POW. Clavell is best known for his epic Asian Saga series of novels and their televised adaptations, along with such films as The Great Escape, The Fly and To Sir, with Love. James Clavell. (2007, November 10). In Wikipedia, The Free Encyclopedia. James Clavell, born Charles Edmund Dumaresq Clavell was a British novelist, screenwriter, director and World War II veteran and POW. Clavell is best known for his epic Asian Saga series of novels and their televised adaptations, along with such films as The Great Escape, The Fly and To Sir, with Love.